We don't do a lot of guns or violent kids shows in our house, but we had fun playing battleship zaPPED. My kiddo is still young, but hubby and I like to play games on our iPad too. We were able to guide my 3 year old into understanding hitting boxes, aliens and other ships instead of people or animals, like other games. This game is exclusively for the iPad and the extra pieces are super fun to be gentle with the iPad. The age range starts at 8 years-old, so it was a BIG stretch for my little man. He enjoyed watching us play and helping fire the gun to defeat the enemy! As I mentioned before, hubby enjoys video games and other fun games. He really liked playing this game too. Pretty water that our boat was cruising in! 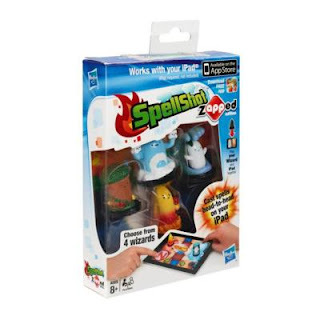 Hubby and I also played speelshot zaPPED. It includes Wizards and casting spells. We don't usually gravitate towards these kinds of games, so it wasn't our favorite. We much preferred the Battleship game. It was fun though to use the game pieces and try out something new. We got four characters and 4 spell cards. It kept us entertained for an evening! 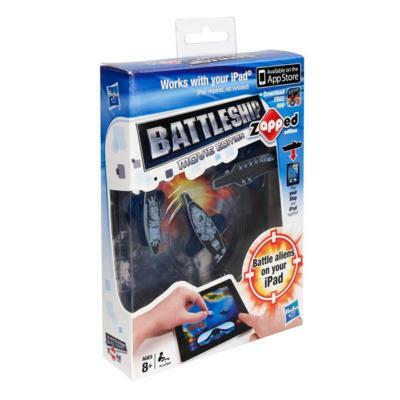 We downloaded the Battleship game for free through iTunes and received a set of ships and spellshot kit from Hasbro. Our opinions are our own and were not influenced or swayed by the company. How neat! Sounds like fun!